Despite being one of the oldest water-regulator structures in the world that is still functional, the Kallanai dam or the Grand Anicut looks almost empty with not much water to regulate. Located near Tiruchirapalli in Tamil Nadu, it was built across river Kaveri around 2,000 years ago by then king Karikala Chola to divert water to the delta region to boost irrigation and also to avoid loss of crops to floods. 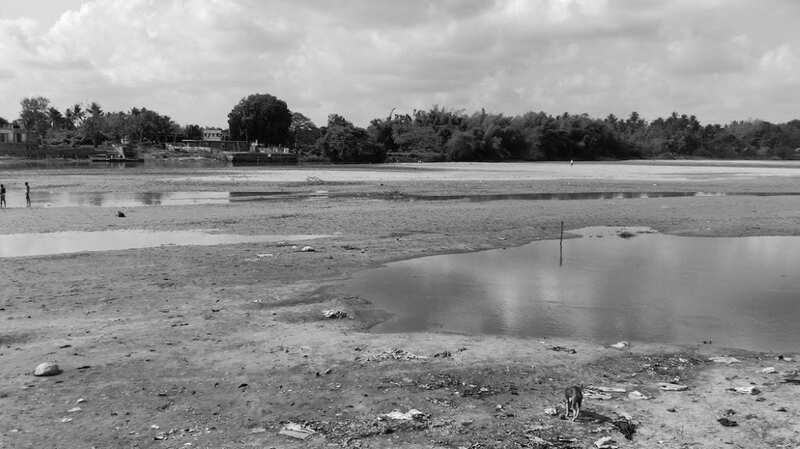 Downstream of Kallanai, the Kaveri river, among the most important rivers of south India, gives a poignant picture of large-scale encroachments and indiscriminate sand mining. Now, no water flows into the Bay of Bengal at Poompuhar, the celebrated coastal town where the river meets the sea. Along with the imminent death of the river, Vimalnathan is pointing out another worrying factor that is threatening the very existence of this traditional ‘granary’ of Tamil Nadu. According to him, the delta region is shrinking fast with cultivable lands increasingly deteriorating into wastelands. To substantiate his claim, Vimal Nathan quoted findings of a study by S Janakarajan, a retired faculty member with the Madras Institute of Development Studies (MIDS). Supported by Indian Council of Social Science Research (ICSSR), the study had focused on change in land use patterns of the delta region in the last four decades. Based on his field level research, spread over three years, Janakarajan says that the delta shrunk already by 20 percent because of anthropogenic factors including diversion of land for non-agricultural purposes. He also cited climate change as a contributing factor. According to Janakarajan, the delta region witnessed a 13-fold increase in wastelands since 1971. The once-prosperous agricultural region is witnessing large-scale reduction in crop cover in recent years mainly due to lack of proper irrigation. The number of farmers who keep their paddy fields fallow due to lack of water is increasing. “It’s no more a dynamic life-giving system that created and promoted civilisations. The Kaveri Water Disputes Tribunal and the governments in Tamil Nadu and Karnataka are considering the river as a mere water channel. The water wars between Karnataka and Tamil Nadu would end sooner or later as the river dries,” said Kaveri S Dhanapalan, president of Nagappattinam-based Kaveri Delta Farmers Association. Tamil Nadu is blessed with 416 km of the 800 km long Kaveri and most parts of the river are running through the delta region. But even the available water remains extremely contaminated causing irreparable damage to both soil and agriculture. Chemical factories located in the close vicinity of the Stanley Reservoir in Mettur have been identified as major polluters of the river. Mass fish mortality is reported from the delta region regularly. In the downstream region, tens of small- and medium-scale chemical industries continue to discharge their effluents through natural drains and engineered canals into the Kaveri. A water-guzzling coal-fired thermal power plant at Mettur is also contributing to the present sorry state of affairs in Kaveri. The plant has permission to draw 184 million litres per day (MLD) of river water. Coal ash from the plant is often dumped up on a hill, from where it finds its way back to the river. River Bhavani, a major tributary of the Kaveri joins it in Erode. It brings with it effluents from dyeing industries, leather tanneries and pulp and paper mills – large scale water-users and heavier polluters. Further south, the industrial town of Salem discharges about 35 MLD of untreated sewage into the Kaveri through the Thirumanimuthar rivulet. “Now our agriculture is at the mercy of monsoon. The survival concerns are turning more intense than ever before,” said Dhanapalan. The shrinking delta and its after-effects are now visible across Thanjavur, Tiruvarur, Nagapattinam, a part of Cuddalore district of Tamil Nadu and Karaikal region of Puducherry Union Territory. Sand being mined from the Kaveri bed. While paddy cultivation is facing troubles, crops such as cotton, pulses, sugarcane, banana and vegetables are making significant inroads into the delta region. In the tail-end areas of the delta, paddy cultivation has turned into a gamble because of salinity, flooding and scarcity of water. “The delta districts contribute a substantial portion of Tamil Nadu’s foodgrain requirement and any threat to the cropping pattern would destabilise the food security. On another level, the grim situation has started affecting the livelihood resources of the thousands of farmers and farm workers,” said farmers’ leader Mannargudi S Ranganathan, who exhorts for movement to save the delta. Interestingly, there is a considerable increase of mangrove cover in the region. “You may feel happy about the increase of mangrove cover. But it reflects a grave reality. Mangrove cover is increasing due to seawater ingress in the coastal areas. Available data indicate that the mangrove cover has gone up nearly 14 times since 1971,” said Vimalnathan. According to Janakarajan, 72 percent of the low-lying land in Tamil Nadu falls under the delta region along the coast. Now the land in this region is at greater risk of submergence as a result of rising sea levels due to climate change. In most of the coastal portions of delta region, land is located at an elevation of merely a metre from the sea. Dams located in Kaveri and its feeders are reducing sediment flow to the delta, which otherwise helps maintain the critical elevation level from the sea. Janakarajan confirms that the delta lost 80 percent in sediment deposit over the last century. Photo by Ricardo Martins / Wikimedia Commons. Rice cultivation in the Kaveri delta. While the delta is facing decrease in sediment deposit, the Mettur dam is facing water storage problems due to siltation. Built in 1934, the dam used to have a storage capacity of 2,708.8 million cubic metres (MCM). By 2004, this was reduced to 1,994.2 MCM. Besides, data reveal that its capacity had reduced further to 1,889 MCM in 2015. Sediment flow to the Kaveri delta has been practically nil of late, as per a 2015 report by the Central Water Commission. Due to seawater ingress, the coastal portion of the delta region is witnessing a substantial rise in shrimp farming, which is detrimental to agricultural practice. Periodic storm surges in the delta are also contributing to the frightening situation. “We need to build resilience in the face of complete destruction. Government and scientific experts are bound to formulate and implement solutions. The worsening economic vulnerability of the delta farmer itself is a clear indication of the sorry state of affairs. As the region accounting for 30 percent of the food grain production in Tamil Nadu, it is imperative that the crisis engulfing the region is resolved sooner rather than later,” says Dhanapalan. With the union government having initiated a massive hydrocarbon extraction project in the delta region, unmindful of the environmental and livelihood concerns, farmers are turning hopeless of a better tomorrow. Like in the case of all other rivers, Kaveri also requires enhanced supply and it can be achieved by preventing pollution. The river’s catchments, banks and riverbeds have to be conserved and restored. Efforts are also needed to replace water-intensive agriculture and industrial practices which presently killing the river. Map of the Kaveri basin. Credit: Water Resources Information System of India. In the past couple of years, farmers from the Kaveri delta have been trying desperately to bring their issues into national attention. In March 2018, farmers from the delta had rolled on to the scorching streets of Delhi with partly shaven heads and mustaches, seeking steps to resolve their grievances. Some others who took part in the Kisan Mukti march were seen carrying skulls of farmers from the delta, who committed suicide due to indebtedness. In Trichy, they organised a march by holding dead rats in their mouths. During this election season the farmers of Kaveri delta are making another attempt to reach their issues to the national leaders. If the statement by National South-India River Linking Agriculturalists Association leader P. Ayyakannu is anything to go by, the firebrand farmers’ leader from Kaveri delta region will contest in Varanasi Lok Sabha constituency in Uttar Pradesh, where Prime Minister Narendra Modi is seeking public mandate for the second consecutive time. According to Ayyakannu, 110 other farmers from the drought-hit delta region will also contest against the Prime Minister in Varanasi, stressing the need for governmental support to make farming activities profitable. “If the Prime Minister assures steps to solve the prevailing agrarian crisis before the elections, we all would withdraw from the contest. Otherwise, we would contest and highlight the crisis being faced by the farmers of delta region at the national level,” he told Mongabay-India. Meanwhile, the federation of farmers’ associations in the delta has extended its support to the DMK-led opposition alliance in which Congress and left parties are partners. The support is based on the assurance from the alliance that it would declare the entire Kaveri delta region as a protected agricultural zone, a long pending demand of farmers. If declared so, farmers hope that would overrule the chances of large-scale carbon extraction from the delta region as desired by the union government for the last decade. Banner image: The view of river Kaveri near Trichy. Photo by KA Shaji.